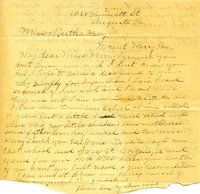 Mrs. Davenport writes to Miss Berry to ask for her help in reorganizing and running the school at which she teaches. She explains that she teaches poor young children, many orphans, and needs help. She asks Miss Berry to send books, paper, old clothes and shoes.